2017 In A Sentence: For the second straight year, Grambling defeated Alcorn State in the SWAC Championship game to win the SWAC., but this time when they faced NCAT in the Celebration Bowl, they were unable to defend their bowl win there in 2016, falling instead to the Aggies 21-14. Still, their 1-2 record was a great achievement for Broderick Fobbs and his team. Biggest Shoes to Fill: “All” QB Devante Kinkade did for Grambling is finish 22-2 as a Tiger starter, pass for 5,924 yards and 54 touchdowns in those two years, and guide Grambling to a perfect 16-0 conference record, two SWAC Championships and a Celebration Bowl win. All Fobbs needs to do now is to find the next Devante Kinkade and do the same thing again. Simple, right? Key Player: Known first from the Netflix series Last Chance U, former East Mississippi State CC LB De’Arius Christmas is a bona-fide defensive star in the SWAC, winning defensive player of the year honors as he notched 88 tackles, 48 solo stops and 17 1/2 tackles for loss. He’s a baller that has NFL scouts excited. 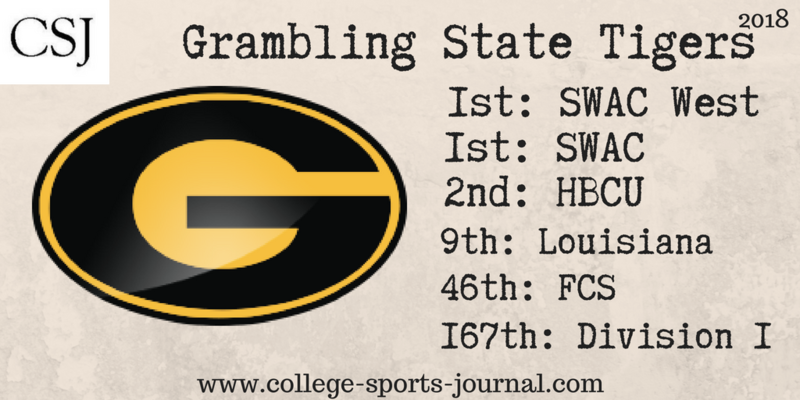 Fearless Prediction: Will Grambling be able to build their offense around a new quarterback? The potential dominance of the Tigers’ defense makes that task easier, as Fobbs’ crew should have enough talent and time to gel in order to win SWAC West one more year. The question is what might happen in a SWAC Championship game against Alcorn – can Grambling win three straight?